Teledyne DALSA demonstrates its Wafer-Level-Packaged (WLP) 320 x 240 Vanadium Oxide microbolometer. Why is it such a big deal? The vacuum packaging cost is a major contributor to the micorbolometer imager price and its reduction is a breakthrough for the whole industry. The company says: "Our novel wafer-level packaging (WLP) approach to microbolometer manufacturing in an optimized MEMS infrastructure gives us the ability to dramatically alter the traditional price-performance tradeoff. 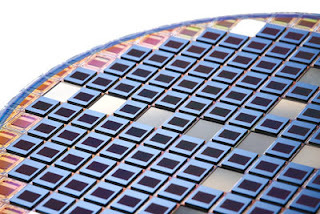 Our advanced capabilities in wafer processing allows us to bond multiple 200 mm wafers precisely in a 3D stack that eliminates the need for external chip packaging--packaging which can account for 75% or more of device cost. By stacking a cap wafer, using world-leading vacuum sealing technology, onto a CMOS high-speed readout circuit (ROIC) wafer populated with VOx pixels, we deliver smaller, lighter devices with leading edge performance and game-changing lower costs, enabling compact detectors with advanced integrated features that will drive the next phase in the evolution of uncooled IR imaging." 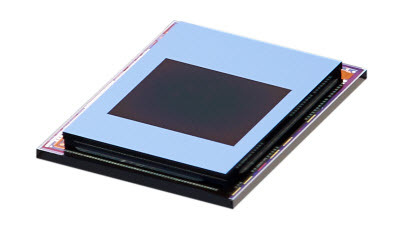 Renesas is Back in Image Sensor Business! BusinessWire: Renesas announces a new high-sensitivity 8.48MP CMOS sensor (RAA462113FYL) for 4K security cameras. 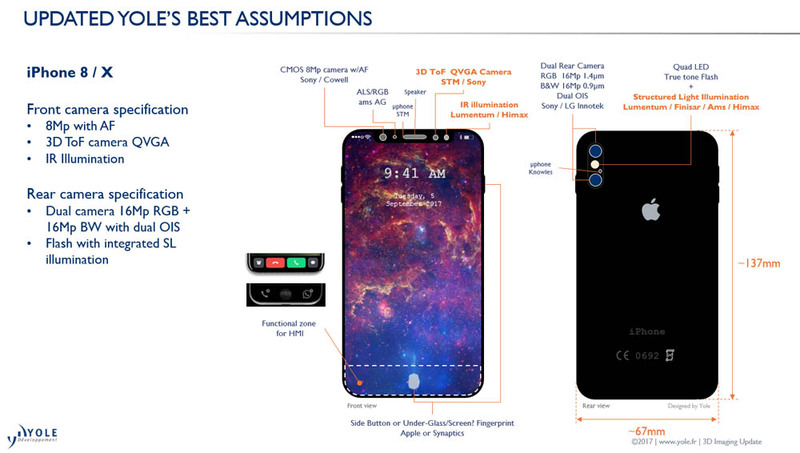 The company also talks about existing 2.12MP product that is already in mass production, but has never been widely announced. The new sensor supports a line-by-line HDR mode in which long exposure data and short exposure data are output separately for each line. This allows video capture for high-contrast scenes. Samples of the RAA462113FYL are now available and mass production is scheduled to begin in December 2017. "The future of mobile dual cameras is brighter than ever. Adoption rates surpassed analysts' predictions, and all major OEMs plan to launch or have already launched handsets with zoom dual cameras. Now the race begins for higher zoom factors, better optical stabilization, lower Z-heights and better low-light performance — anything that improves the overall camera and handset user experience. In this paper, we discussed some ways to increase the zoom factor and reduce the Z-height while maintaining superior image quality." PRNewswire, GlobeNewsWire: Qualcomm and Himax jointly announce a collaboration on low power active 3D depth sensing camera for use cases such as biometric face authentication, 3D reconstruction, and scene perception for mobile, IoT, surveillance, automotive and AR/VR. Qualcomm expertise in computer vision and algorithm with Himax's technologies in wafer optics, sensing, driver, and module integration are combined in a fully integrated SLiM (Structured Light Module) 3D solution. The SLiM is a turn-key 3D camera module that delivers real-time depth sensing and 3D point cloud generation with high resolution and high accuracy for indoor and outdoor environments. Qualcomm and Himax will commercialize the SLiM for a wide array of markets and industries with mass production targeting in Q1/2018. "Our 3D sensing solution will be a game changing technology for smartphones, where we will enable the Android ecosystem to provide the next generation of mobile user experience," said Jordan Wu, President and CEO of Himax. "Our two companies have worked together for more than four years to design the SLiM 3D sensing solution to meet growing demands for enhanced computer vision capabilities that will enable amazing new features and use cases in a broad range of markets and applications. We are pleased to partner with Qualcomm Technologies to put together an ecosystem and to enable the revolutionary computer vision solutions for our customers globally in a timely fashion." Thanks to OB for the link! "Despite just 3% growth in the volume of cars sold expected through to 2022, Yole expects an average growth rate in sensors sales volumes above 8% over the next five years, and above 14% growth in sales value. This is thanks to the expanding integration of high value sensing modules like RADAR, imaging and LiDAR. Among all sensing technologies located in the car, three main sensors will drastically change the landscape: imaging, RADAR and LiDAR sensors. 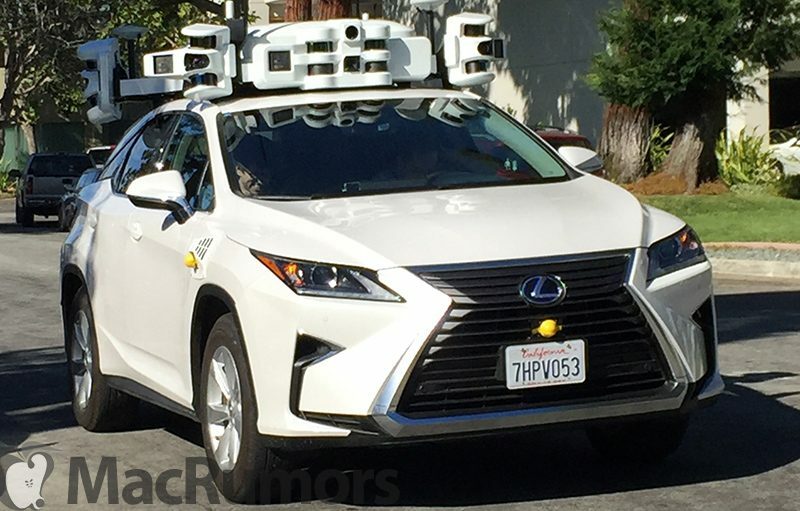 Imaging sensors were initially mounted for ADAS purposes in high-end vehicles, with deep learning image analysis techniques promoting early adoption. It is now a well-established fact that vision-based AEB is possible and saves lives. Adoption of forward ADAS cameras will therefore accelerate. Growth of imaging for automotive is also being fueled by the park assist application, and 360° surround view camera volumes are skyrocketing. While it is becoming mandatory in the US to have a rear view camera, that uptake is dwarfed by 360° surround view cameras, which enable a “bird’s eye view” perspective. This trend is most beneficial to companies like Omnivision at sensor level and Panasonic and Valeo, which have become the main manufacturers of automotive cameras. LiDAR remains the “Holy Grail” for most automotive players, allowing 3D sensing of the environment. In this report Yole’ analysts highlight the different potential usages of this technology, which will transform the transportation industry completely. 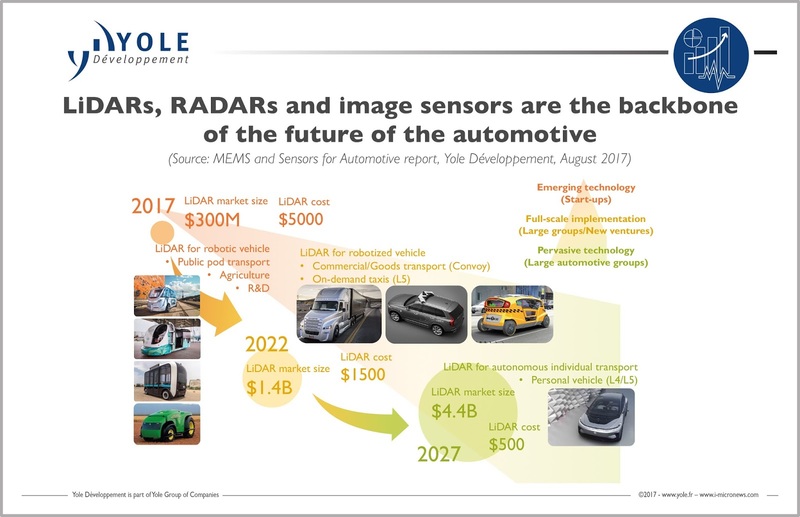 “We expect tremendous growth of the LiDAR market within the next five years, from being worth US$300 million in 2017 to US$4.4 billion by 2022,” details Guillaume Girardin from Yole. LiDAR is expected to be a key technology, but sensing redundancy will still be the backbone of the automotive world where security remains the golden rule." Medium, China Money Network: China-based Cambricon AI startup raises $100M at reported $1b valuation. Cambricon was founded by Prof. Chen Tianshi in 2016 as a spin-off from the Institute of Computing Technology of the Chinese Academy of Science. 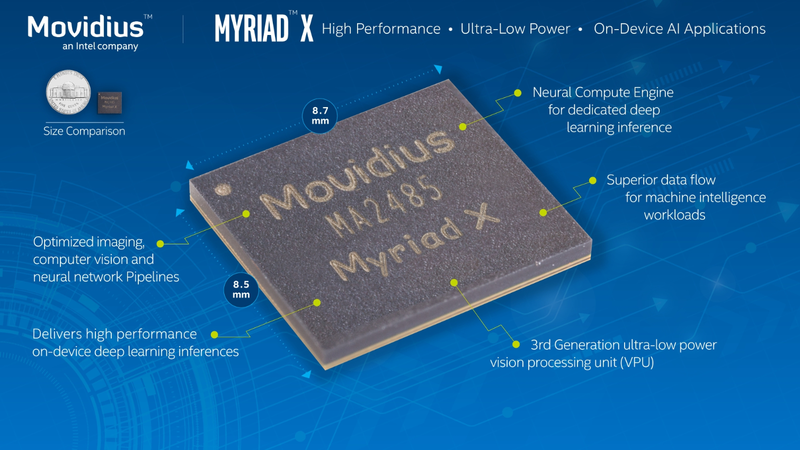 Its processor, the Cambricon-1A, is claimed to be the first commercial chip for deep learning applications and can be used in robotics, drones, autonomous vehicles and consumer electronics. It is said to have a better performance when running mainstream AI algorithms, is more energy efficient and has a higher integration density. The total revenue of the AI-related deep learning chip market is forecast to rise from $500M in 2016 to $12.2b in 2025 at CAGR of over 40%, according to Tractica market research. Update: Digitimes reports that Cambricon expects to roll out hundreds of millions of AI SoCs for smart terminal devices and servers in the next three years, the CEO Chen Tianshi said. Cambricon will license its processor instruction set to more enterprises engaged in AI applications. In this regard, Huawei's HiSilicon Kirin 970 chipset, to be released in September, is to carry the IP instruction set for Cambricon-1A co-processor. "Until earlier this year everyone thought 3D cameras would appear on the rear of Apple’s new iPhones, as is the case in the Lenovo Phab 2 Pro, in order to develop Augmented Reality applications. This changed radically when Ming Chi Kuo, an analyst from KGI Securities, confirmed in April 2017 that there would be a front 3D camera... Most analysts speculate that this camera would exploit “structured light”, because of Primesense’s involvement. 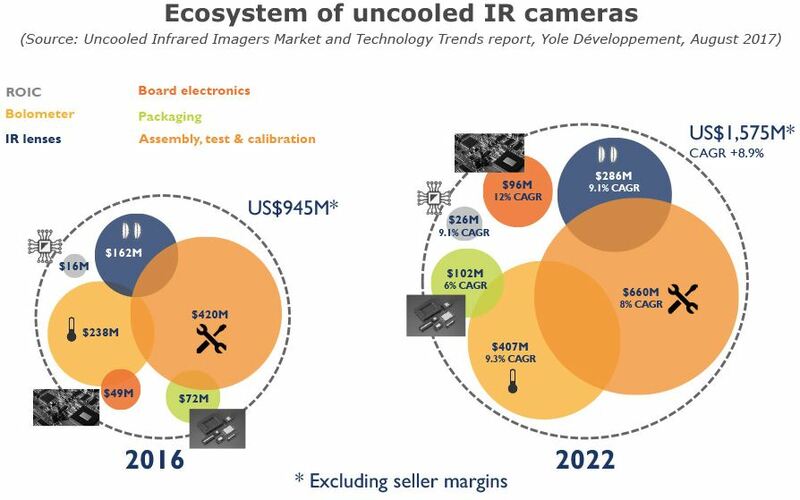 However, Yole maintains its original idea of a Time of Flight (ToF) camera on the front due to the nature of the application, which is to be a new revolutionary user interface." "Xintec used to rely on orders from OmniVision. However, the acquisition of OmniVision by a group of China-based investors led by state-owned Hua Capital Management in 2016 has had an adverse impact on Xintec's business in the image sensor field, the observers indicated. Xintec is also facing increased competition from its China-based rivals in the fingerprint sensor sector. Nevertheless, Xintec is reportedly among the companies joining Apple's and Qualcomm's 3D sensing supply chains, which also included its largest shareholder Taiwan Semiconductor Manufacturing Company (TSMC). Xintec may begin to see the light at the end of tunnel as early as 2018, the observers noted." 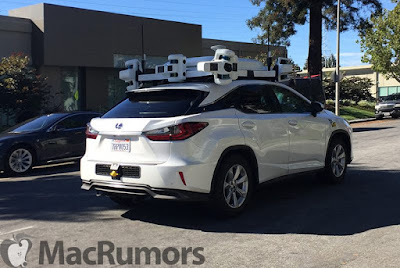 Macrumors and IF News quote KGI securities analyst Ming-Chi Kuo saying that Apple 3D camera technology is 1.5-2 years ahead of Qualcomm one. Apple is expected to use 3D frontside camera in one of its upcoming iPhones for face recognition and user interface. "According to Kuo, Qualcomm is dealing with immature algorithms and an unfavorable hardware reference design for smartphones due to form factor design and thermal issues. Qualcomm may also be impacted by Apple's choice of suppliers. Many key component suppliers have already allocated resources to Apple, so Qualcomm has to find different suppliers in order to obtain sufficient resources." So far, only Xiaomi 2018 flagship phone is expected to use Qualcomm 3D solution with volumes less than 10M units, according to Kuo. Even this might be cancelled, depending on the new iPhone success. 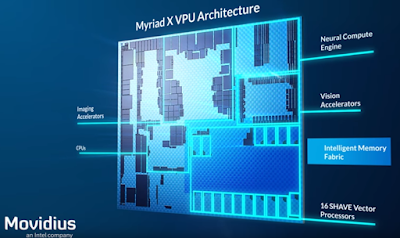 PRNewsWire: Spreadtrum announces mass production of its LTE SoC platforms: SC9853I manufactured in Intel's 14nm foundry process with Octa-core 64-bit Intel Airmont processor; and Spreadtrum SC9850 series. Both SC9853I and SC9850 series emphasize dual-camera processing capability. Both include a built-in 3DNR to improve night shooting and features like refocusing, real-time face beauty, 3D modeling and AR. SC9853I supports 16MP dual camera, while SC9850 supports 13MP dual configuration. Sony patent application US20170229493 "Pixel circuit and imaging apparatus" by Kouichi Harada and Toshiyuki Nishihara proposes dark current reduction in bulk charge modulated device (BCMD). "...the above image sensor needs to read 1000 times in one frame for example, and has problems of increase in read voltage and increase in read time. Also, as the number of reads per frame increases, dark current of the FD increases proportionally. As a result, the dark current of the FD becomes the main component of the dark current of the pixel. The dark current of the FD is unable to be reduced easily, and thus even if the conversion efficiency can be set to 600 μV/e−, the accuracy of detecting one photon is reduced. If there is no FD, the accuracy of detecting one photon is improved. ...According to the present technology, it is possible to obtain an excellent effect that the dark current of the FD in the image sensor is eliminated, and that the conversion efficiency of converting the electric charge to a voltage can be improved." BASF spinoff Trimamix publishes an arxiv.org paper "Focus-Induced Photoresponse: a novel optoelectronic distance measurement technique" by Oili Pekkola, Christoph Lungenschmied, Peter Fejes, Anke Handreck, Wilfried Hermes, Stephan Irle, Christian Lennartz, Christian Schildknecht, Peter Schillen, Patrick Schindler, Robert Send, Sebastian Valouch, Erwin Thiel, and Ingmar Bruder. "Here we introduce Focus-Induced Photoresponse (FIP), a novel method to measure distances. In a FIP-based system, distance is determined by using the analog photoresponse of a single pixel sensor. This means that the advantages of high-density pixelation and high-speed response are not necessary or even relevant for the FIP technique. High resolution can be achieved without the limitations of pixel size, and detectors selected for a FIP system can be orders of magnitude slower than those required by ToF based ones. A system based on FIP does not require advanced sensor manufacturing processes to function, making adoption of unusual sensors more economically feasible. In the FIP technique, a light source is imaged onto the photodetector by a lens. The size of its image depends on the position of the detector with respect to the focused image plane. FIP exploits the nonlinearly irradiance-dependent photoresponse of semiconductor devices. This means that the signal of a photodetector not only depends on the incident radiant power, but also on its density on the sensor area, the irradiance. This phenomenon will cause the output of the detector to change when the same amount of light is focused or defocused on it. This is what we call the FIP effect." Albert Theuwissen releases the first report on "Reproducibility, Variability and Reliability of CIS" in a 5-year series. The 175-page report contains 118 figures and 98 tables with data on QE, FPN, DSNU, Qsat, DR, SNR, DC, and more. "The two lenses may look the same, but they have very different functions. One shoots in RGB to produce a color image, while the other takes care of the monochrome images. The monochrome lens brings out the detail, and engage more light than the RGB lens when in low-light condition, which takes care of the colors. The Dual camera 2.0 technology in Cool Dual actually enhanced the overall clarity of the image by 20%, help reduce image noise by 8% and improved brightness by 20%. 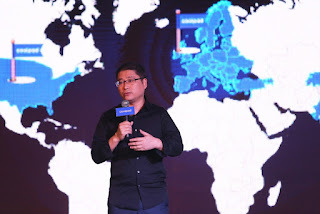 “With these, we believe the real dual 13MP cameras brings us smart framing and the 6P lens gives customers the best quality of pictures”, said Jeff Liu, Coolpad Group CEO." ...only one million LiDAR sensors worth US$200 million will be shipped globally in 2019. However, global shipment value for LiDAR sensors will fast grow to US$500 million in 2024 along with decreasing cost and increasing adoption. ...Velodyne LiDAR and Quanergy Systems, and Germany-based Ibeo Automotive Systems are the main vendors globally of LiDAR sensors, with the former two focusing on solid-state models to reduce LiDAR sensor sizes." 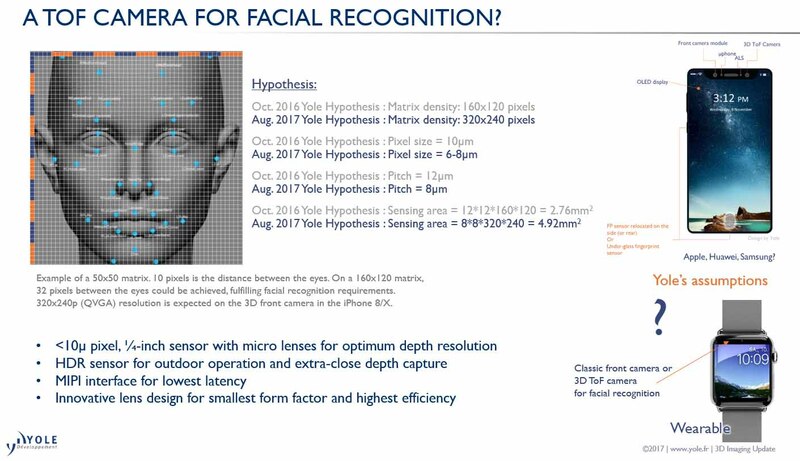 Qualcomm announces an expansion to the Qualcomm Spectra Module Program to incorporate a biometric authentication and high-resolution depth sensing for a broad range of mobile devices and head mounted displays (HMD). This module program is built on the 2nd generation Spectra embedded ISP family. Now, the camera module program is being expanded to include new camera modules capable of utilizing active sensing for biometric authentication, and structured light for a variety of computer vision applications that require real-time, dense depth map generation and segmentation. The low-power, high-performance motion tracking capabilities of the Qualcomm Spectra ISP, in addition to optimized simultaneous localization and mapping (SLAM) algorithms, are designed to support new extended reality (XR) use cases for VR and AR applications that require SLAM. It also features multi-frame noise reduction for superior photographic quality, along with hardware-accelerated motion compensated temporal filtering (MCTF), and inline electronic image stabilization (EIS) for superior camcorder-like video quality. The Spectra family of ISPs and new Spectra camera modules are expected to be part of the next flagship Snapdragon Mobile Platform. Qualcomm Emerging Vision Technologies presentation gives some use cases for its 3D depth sensing module. Pinnacle Imaging Systems launches Denali-MC HDR ISP IP core said to preserve a scene’s color fidelity and full contrast range throughout the tone mapping process, all without producing halos, color shifts, and undesired motion artifacts. Denali-MC provides a 16-bit data path capable of producing 100 dB or 16-EV steps of dynamic range. Denali-MC HDR IP completely eliminates halo artifacts and color shifts, and mitigates the ghost artifacts and transition noise often seen when merging multiple exposures. This allows Denali-MC to capture up to four exposure frames from 1080p video at 120 fps, while merging and tone mapping at 30 fps in real time. For applications requiring faster output frame rates, Denali-MC also supports a two frame merge mode exporting at 60 fps. Furthermore, Denali-MC can support up to 29 different CMOS sensors, including 9 Aptina/ON Semi, 6 Omnivision and 11 Sony sensors, and 12 different pixel-level gain and frame-set HDR methods, and is said to be easily ported to the most widely-used logic platforms. "In 2016, the night vision devices segment accounted for close to 55% of the total revenues due to high adoption of low light level imaging sensors by the defense sector. The increasing focus on reducing road accidents drives the demand for night vision systems. Night vision systems are offered as built-in systems by Audi, BMW, and Toyota. The market is expected to grow at a CAGR of close to 16% during the forecast period. 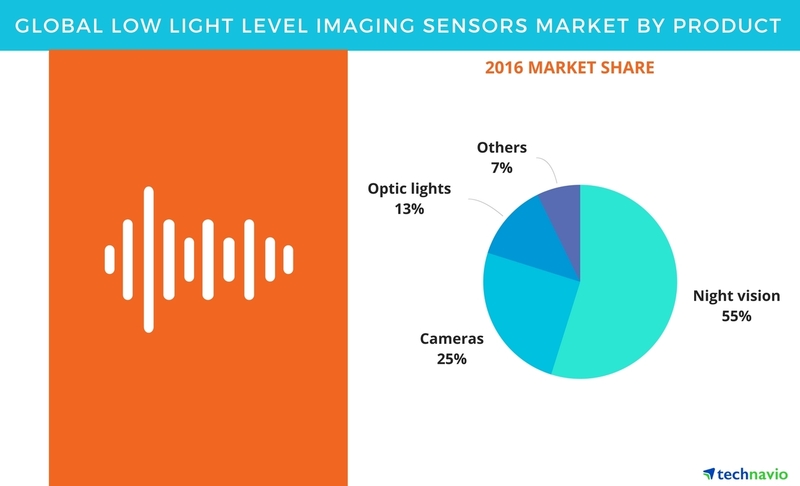 The global low light level imaging sensors market by cameras contributed 25% of the total revenues in 2016. These sensors are used in applications such as home security cameras, small business monitoring, and infrastructure security. In 2016, the global low light level imaging sensors market by optic lights accounted for around 13% of the total revenue in 2016. These are widely used in lighting, decorations, and mechanical inspections of obscure things. Optic lights save space and provide superior lighting, and are therefore used in vehicles. Low light level imaging sensors are crucial components of optic lights as these sensors intensify the range of light." "By device, most of our year-on-year revenue growth came from CMOS image sensors, NOR Flash, application processors and the power ICs. And for the existing customer, for... the CMOS imager applications, we also see the recovery, yes." BusinessWire: The upcoming LG V30 smartphone is said to have camera module with F#1.6 lens, said to be the brightest in smartphones. I wonder what is the effective aperture of the pixels in the sensor and whether it makes use of the so bright lens. Sony introduces IMX307 and IMX327 sensors featuring 2.9um pixels. The 1080p60 sensors support multiple-exposure and DOL-HDR and have 12b ADC. Q: Why did you decide to buck the trend in semiconductors to have your own foundry? 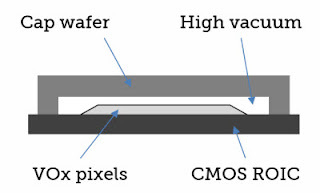 A: Simply there was or is no silicon CMOS technology available which offered high Quantum Efficiency in NIR in combination with high performance CCD. Our backside illumination technology OHC15L offers what is needed for powerful LiDAR, TOF and in general ultrafast gated imagers. Q: Your session on time-of-flight sensors is about next generation technology – what’s different about it from existing ToF? Q: What is the timescale of this technology coming to the market? 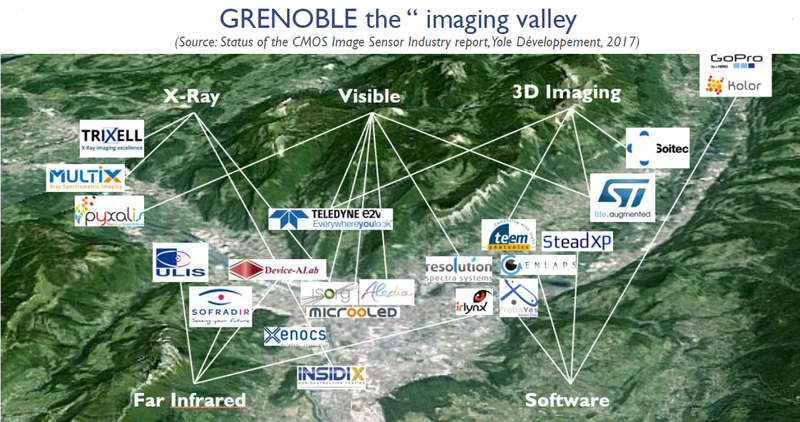 The article gives a very nice overview of the history and contemporary state of the French Imaging Valley. Thanks to JD for the link! 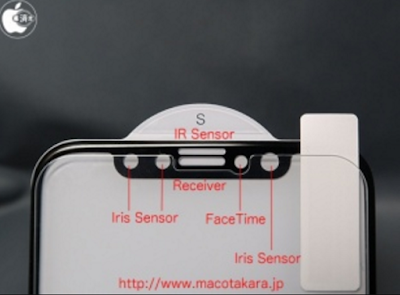 "During the second quarter, we exited the mobile image sensor market as the margin profile for that business was not comparable with our target financial model. Furthermore, we monetize the value of highly differentiated mobile imaging technology, through an intellectual property licensing agreement with a third-party. We have excluded the gain of approximately $24 million related to this transaction from our second quarter non-GAAP results. Second quarter free cash flow and operating cash flow included approximately $24 million from a licensing arrangement related to the mobile image sensor business. 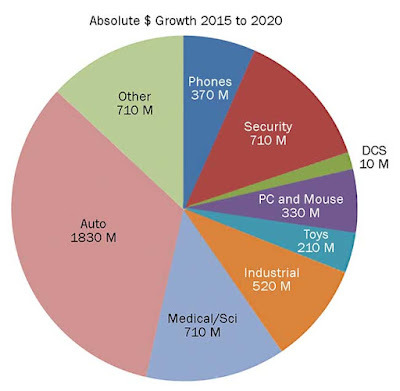 For the second quarter, we again posted strong growth in our CMOS image sensor business for viewing and ADAS applications. 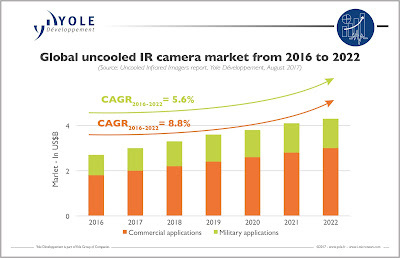 We continue to gain market share in automotive image sensors and our design win pipeline for our CMOS image sensors for automotive applications continues to grow at a rapid pace. 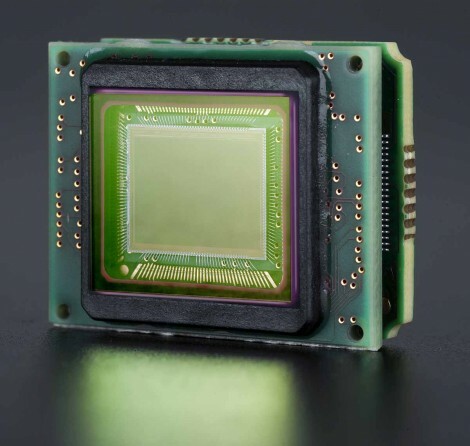 We continue to see strong growth in machine vision applications with our PYTHON line of CMOS image sensors. As I indicated earlier, we are engaging at the very early stage with key players in artificial intelligence for machine vision and robotics applications." University North Caroline at Chapel Hill presents "A Frameless Imaging Sensor with Asynchronous Pixels: An Architectural Evaluation" by Montek Singh, Pintian Zhang, Andrew Vitkus, Ketan Mayer-Patel, and Leandra Vicci at 2017 IEEE Intl Symposium on Asynchronous Circuits and Systems. "The goal of this work is to develop a novel CMOS camera sensor that provides frameless capture, and has significantly higher dynamic range, finer color sensitivity, and lower noise as compared to the current state-of-the-art sensors. The strength of the approach lies not in developing new types of photodetectors or amplifiers, but in the manner in which information is extracted from the pixel sensor, transported to the processing logic, and processed to yield intensity values. At the heart of the sensor is an asynchronous network to transport events from the pixel sensors to the off-grid processing circuitry. The asynchronous nature of pixel communication is the key to achieving frameless image capture." The UNC Chapel Hill research group is looking for industrial partners who might be interested in the IP and in partnering with the group for further development. "Based on the new technology concept, the company recently released a QVGA resolution (320 by 240 pixels) sensor with a pixel size of 30-microns on a side and quoted power efficiency of less than 10mW. Because the sensor is able to detect the dynamics of a scene at the temporal resolution of few microseconds (approximately 10 usec) depending on the lighting conditions, the device can achieve the equivalent of 100,000 frames/sec. In Chronocam’s vision sensor, the incident light intensity is not encoded in amounts of charge, voltage, or current but in the timing of pulses or pulse edges. This scheme allows each pixel to autonomously choose its own integration time. By shifting performance constraints from the voltage domain into the time domain, the dynamic range is no longer limited by the power supply rails. Therefore, the maximum integration time is limited by the dark current (typically seconds) and the shortest integration time by the maximum achievable photocurrent and the sense node capacitance of the device (typically microseconds). Hence, a dynamic range of 120dB can be achieved with the Chronocam technology. Due to the fact that the imager also reduces the redundancy in the video data transmitted, it also performs the equivalent of a 100x video compression on the image data on chip. The company announced it had raised $15 million in funding from Intel Capital, along with iBionext, Robert Bosch Venture Capital GmbH, 360 Capital, CEAi and Renault Group." International Image Sensors Workshop 2017 held in Hiroshima, Japan on May 30-June 2, publishes all 110 presented papers on-line: 61 regular papers, 45 posters, and 4 invited papers. Some of the papers also have presentation slides published. It's a very good read over the weekend! 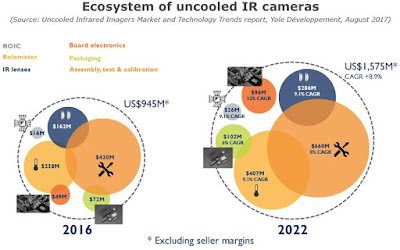 Yole Developpement releases "Uncooled Infrared Imagers market & technology trends" report: "Today the uncooled IR camera market is showing an 8% CAGR between 2016 and 2022 reaching almost US$ 4.4 billion at the end of the period. Only few players control this industry. 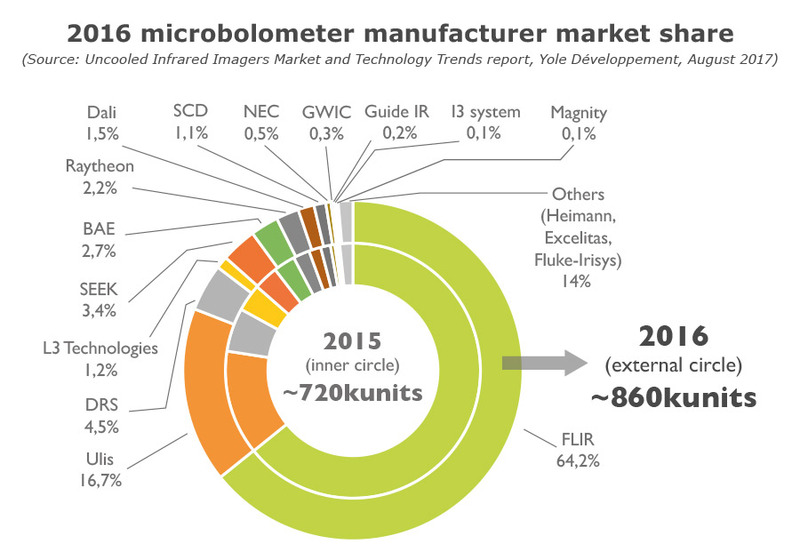 In 2016, two leading companies, FLIR and ULIS, both with different market strategies and solutions, owned more than 75% of the total market (in volume). • SEEK Thermal has introduced its new, higherperformance RevealPRO, and CompactPRO products as the company moves from consumer products to more high-end products. • Players such as BAE Systems or Leonardo DRS are benefiting from the defense market growth cycle that could still last for a few more years. • Newcomers are introducing their products, for example, Teledyne Dalsa released its first Vox microbolometers in 2017. • Many companies in China are developing their own microbolometers. They do not produce large volumes today but the domestic market has great potential. • On the other hand companies like Bosch, long involved in the MEMS and infrared businesses, have changed their strategies." "2016 was a good year for the microbolometer market. 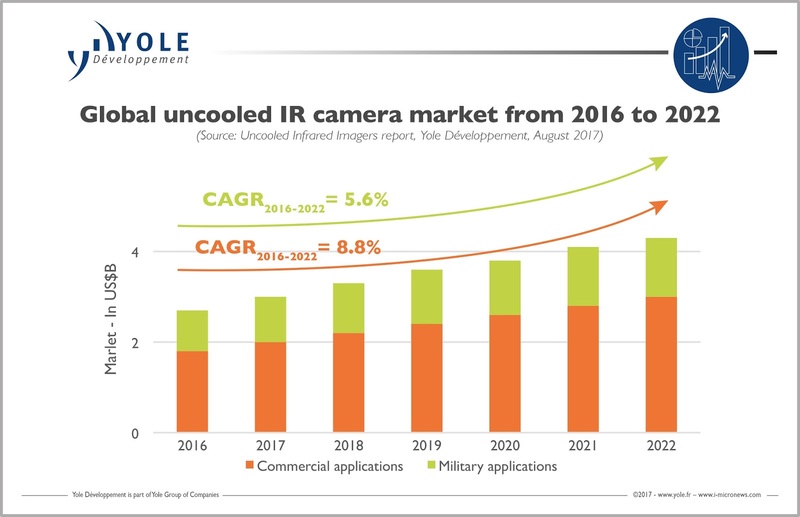 There were almost 900,000 uncooled IR camera shipments, worth $2.7B in revenues thanks to a dynamic commercial market and continued growth for military applications. Many commercial applications drove this growth, including thermography, surveillance, PVS and firefighting. In 2022, we estimate there will be 1.7M units shipped. 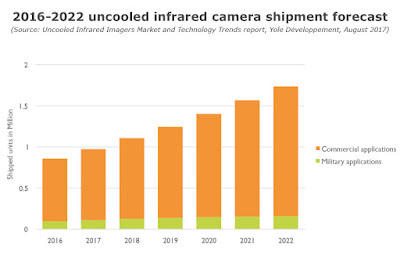 Thermography is still the leading commercial market by far, in both value and volume. 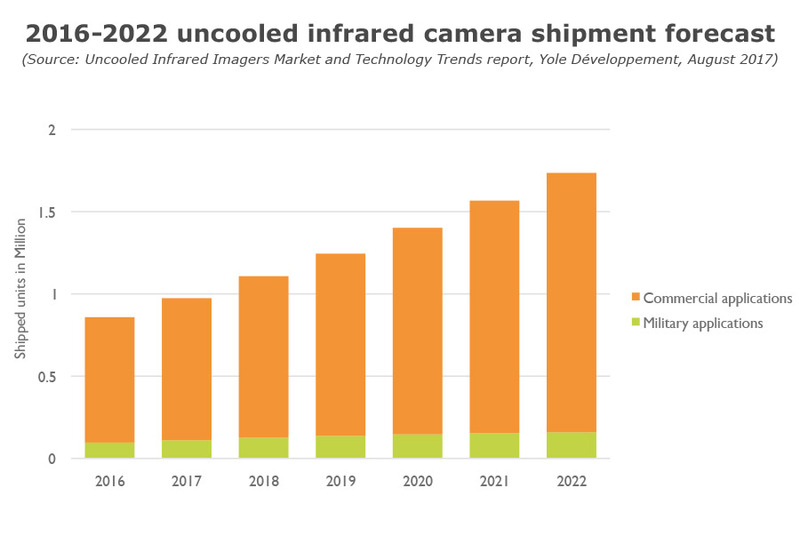 We estimate that there will be 500,000 thermography units shipped annually by 2022. As camera prices continue to fall, with several new products below $1000, sales are growing. Surveillance is another interesting market. Until recently, thermal cameras have primarily been used in high-end surveillance for critical and government infrastructure. New municipal and commercial applications with lower price points are now arising, including traffic, parking, power stations and photovoltaic planning. We estimate this market will grow at almost 17% over 2017-2022 to reach 300,000 units by 2022. Night vision in cars, including autonomous vehicles, could boost the microbolometer market. China is already a large market for automotive night vision, absorbing 25% of the total number of systems produced. In coming years, China will continue to account for a high share of this market."